The metals produced by various reduction processes described above are not very pure. They contain impurities, which must be removed to obtain pure metals. The most widely used method for refining impure metals is electrolytic refining. Many metals, such as copper, zinc, tin, nickel, silver, gold, etc., are refined electrolytically. In this process, the impure metal is made the anode and a thin strip of pure metal is made the cathode. A solution of the metal salt is used as an electrolyte. The apparatus is set up as shown in Fig. 3.12. On passing the current through the electrolyte, the pure metal from the anode dissolves into the electrolyte. 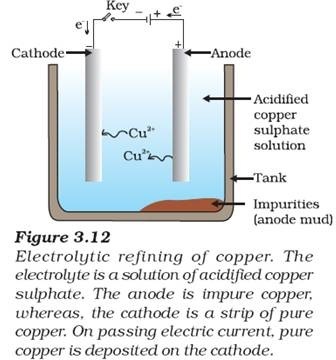 An equivalent amount of pure metal from the electrolyte is deposited on the cathode. The soluble impurities go into the solution, whereas, the insoluble impurities settle down at the bottom of the anode and are known as anode mud. Pingback:Which of the following statements regarding gravity filtration are true ?